Erected by James Butchart between c.1860 and c.1865, Beleura is one of several stately homes constructed as summer retreats along the Mornington Peninsula between 1860 and 1890 for Victoria's rich and famous. The Mornington Peninsula is the second such precinct in Victoria displaying this social phenomena; Mt. Macedon is the first. In 1870 the property was purchased by Charles E. Bright, who married Anna Manners-Sutton, daughter of Viscount Canterbury, Governor of Victoria from 1866 to 1873. For a brief period between 1881 and 1882 Beleura functioned as an educational institution and was leased by the Mornington Grammar School. Theatrical entrepreneur, George Tallis, who was knighted in 1922, purchased the property in 1915 as a summer retreat and, on retirement, developed it as an Ayrshire stud. The estate was taken over by John Tallis, George's son, in 1949 and the property is now managed as a house museum by the Tallis Foundation. Constructed in Free Classical style, Beleura is built on a granite foundation with stuccoed brick walls. The main feature of the single-storeyed rectangular house is the Corinthian colonnade veranda and balustrade parapet; the tower was added at a later date. No plans of the original house or the site are known to exist and there is no record of the architect or builder. John Tallis built on the Italianate influences of the original design and made a series of changes to the interior and exterior of Beleura. Melbourne artist and student of Norman Lindsay, Wesley Penberthy (1920-), produced a series of ceiling paintings, in the entrance hall (1951) and drawing and dining rooms (1954), considered to be the first in Australia painted using polyvinyl acetate (PVA) finish to produce a matt fresco appearance. The garden contains features from three main periods including the original nineteenth century drive way layout, rear courtyards and coniferous trees; the early twentieth century addition of a formal pool designed by Harold Desbrowe Annear; and, John Tallis' mid twentieth century Italian influenced embellishments consisting of a formal rose garden and statuary. Beleura is of historical and architectural significance to the State of Victoria. 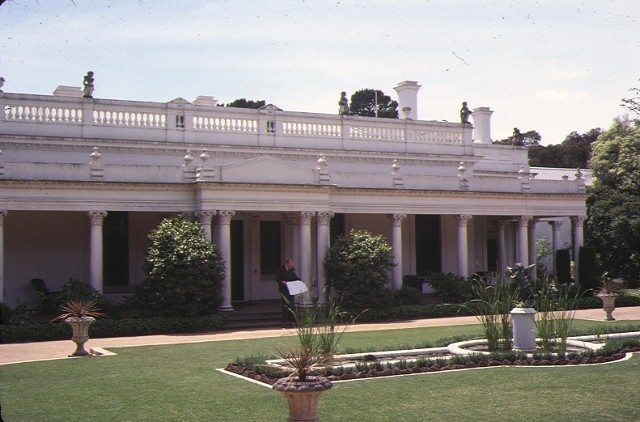 Beleura is of architectural significance as fine example of a nineteenth century villa in Free Classical style with Italian influenced features, most notably, the colonnade veranda, balustrade parapet, and formal gardens. Beleura is historically significant for its association with the pattern and establishment of grand summer retreats along the Mornington Peninsula during the nineteenth century. Historic Building No. 319, "Beleura" (to the extent of the house and the house curtilage as defined by the Title boundaries and fence lines), 42-44 Kalimna Drive, Mornington. The cultural heritage significance of Beleura is due to its Italianate architecture. It is important to retain the scale and plan form of the main building. The main feature of the single-storeyed rectangular house is the Corinthian colonnade veranda and balustrade parapet. The ceiling paintings are important elements of the internal fabric. These features should not be compromised. 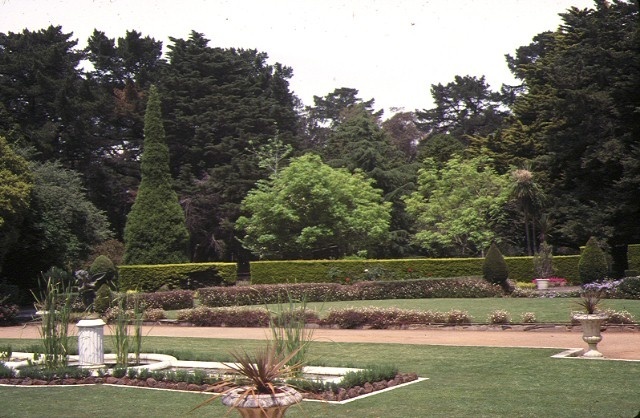 The grounds and gardens contain elements from three different periods in Beleura's history dating from the nineteenth to mid twentieth century. 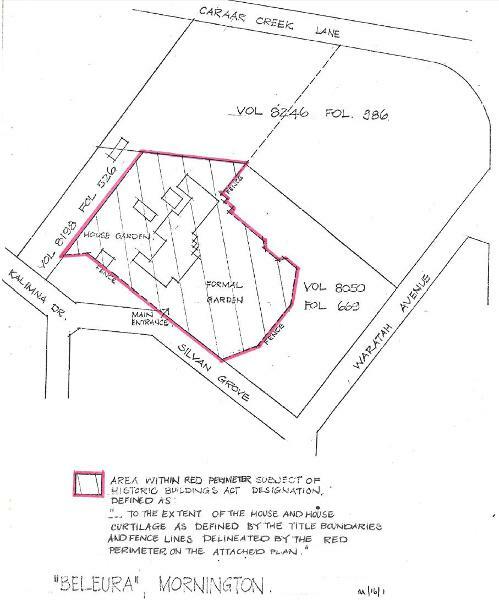 Changes to existing buildings, the addition of new buildings and major changes to the landscaping on the registered land will be subject to permit application.